Quietly the team over at Android Pay have started a new promotion to encourage users to use the tap-and-pay service when they are out shopping. 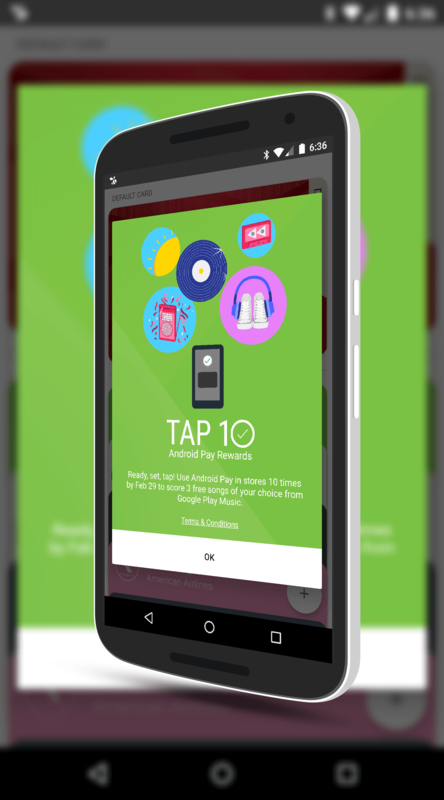 The new Tap 10 promotion is starting to show up for many users in the app and while I wouldn’t characterize it as a great deal, it’s still some freebies just for using it. Now through February 29th, you can earn up to 3 free songs from the Google Play Music store by using your phone to pay. Use it once and you get a free song, then again the 5th time you use it and a final song on the 10th use. To get in on the promotion, just tap the card when it appears in the app on your phone. Google continues to push for more users to use Android Pay as competitive services like Samsung Pay (and rumor has it LG is rolling out one soon too) continue to do well. This doesn’t even consider ApplePay across the mobile spectrum. With more devices now having NFC capabilities, tap-and-pay may just be poised to finally take off in a big way after years of false or stuttered launches. Remember, you have to make 10 purchases through the app by February 29th to get the free songs. Get to tapping!